TVX2014, or as a longer winded version, “ACM International Conference on Interactive Experiences for Television and Online Video 2014” was recently held in Newcastle, UK. Newcastle is the party capital of the UK (cue many arguments…), so it was a lively conference in a lively city! Our long paper, “Disinhibited Abuse of Othered Communities by Second Screening Audiences” (links: eprints, ACM) was a look at how TV viewers treat participants and stars on TV shows. In particular it looked at how the TV show “Thelma’s Gypsy Girls” was commented upon by a second screening audience. 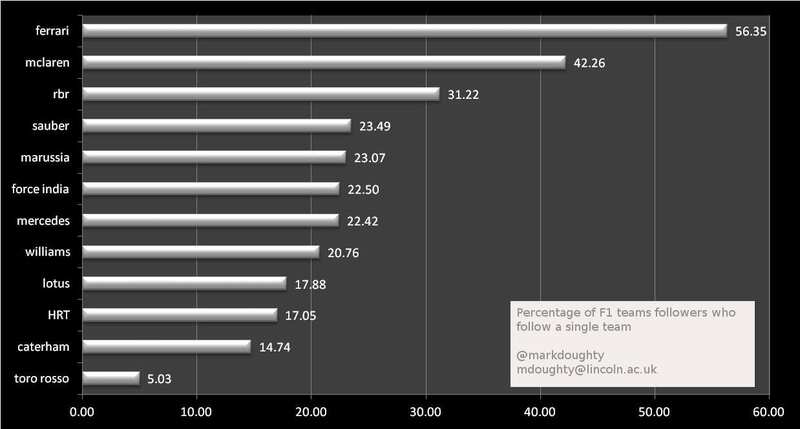 We investigated the tweets that were posted during the show and that contained the “#thelmasgypsygirls” hashtag. When TV shows encourage a discussion of the content and issues that are broadcast through the showing of a hashtag on screen they have no control over that discussion. If it took place in the broadcast, or if the shows producers had some kind of ownership of that discussion then certain ethical and other guidelines must be adhered too. As it is, as the discussion takes place on a completely separate platform and the producers and broadcasters have no control or ownership of the that platform. The discussion falls through a loophole in the ethical guidelines governing broadcast TV and there is no control over it (apart from the platform guidelines, such as Twitter’s terms and conditions). It seems strange that a TV show is encouraging discussion and debate over its content, yet it has no control over that debate. Freedom of speech and liberal censorship and libel laws allow these discussions to take place with only legal repercussions if the debate gets out of hand. TV and Twitter are uneasy bed fellows. On one hand, Twitter sees TV and the discussions which take place around TV shows as vital to its growth and usage in the future. TV shows see Twitter as an important place to host discussions about their issues or content. However, with no control over that debate, it seems that TV shows and the broadcasters are selectively myopic when it comes to these debates. Sure, they can give instant feedback and comments about the show, however, they can also be hate fuelled and libellous towards individuals or groups within the shows. The 1971 classic, “Le Mans” is only very occasionally shown on UK TV. 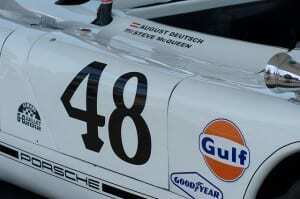 Starring Steve McQueen, the film is considered a benchmark in racing films. McQueen raced this car with Peter Revson (the 48 Porsche 908/2 Spyder) in the 1970 12 Hours of Sebring race, where it came first in its class, and second overall. Yesterday’s Diamond Jubilee River Pageant was a magnificent occasion. As is usual now, the world of twitter was alive with TV viewers discussing, ranting, or just observing the proceedings as they watched. The use of twitter and other social media channels while watching TV is rising in popularity, and it is generating vast amounts of data for researchers. Viewer opinions, thoughts and instant feedback are available to be searched and mined for new perspectives on how we consume our TV entertainment and how we interact with friends and others while we are watching. 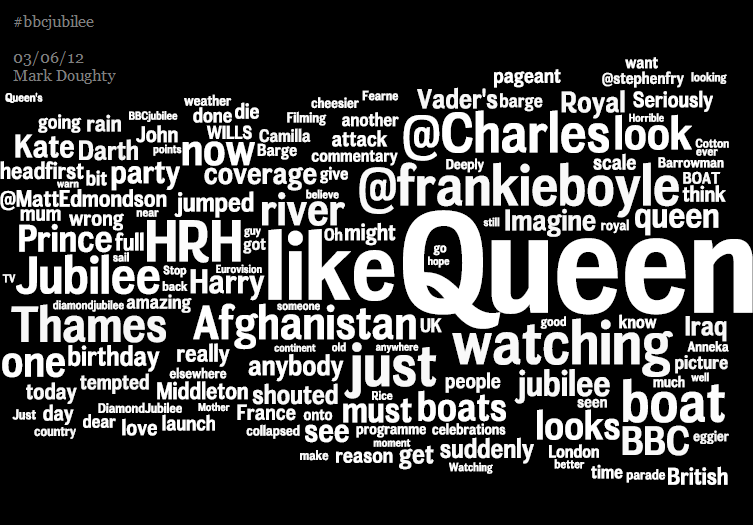 The #bbcjubilee hashtag was a focal point for viewers of the BBC coverage of the Pageant, and I collected over 46,000 tweets during the broadcast. 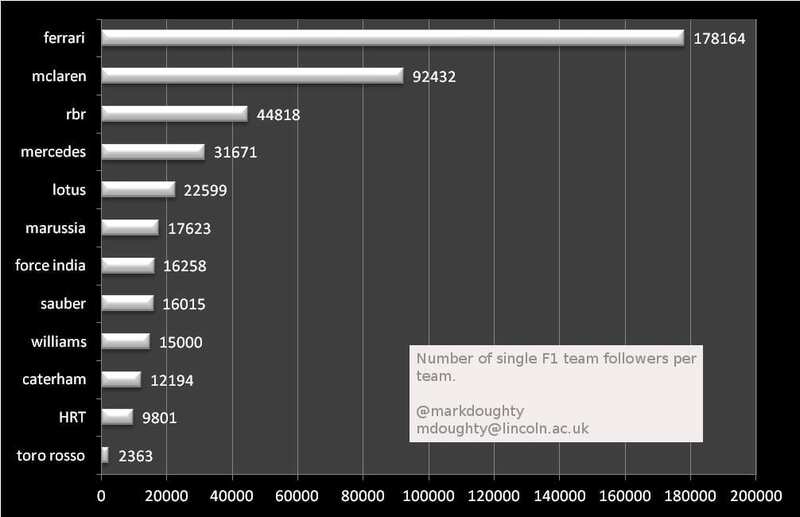 This is a reasonable amount, but doesn’t come near the volumes of tweets produced during XFactor broadcasts for instance – probably reflecting the different viewing demographic and the type of programme. 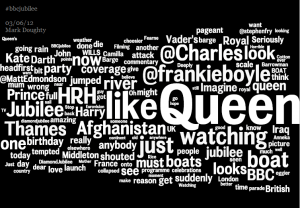 The wordle above shows the relative occurrences of the 150 most popular words in the #bbcjubilee tweets. As you would expect, the Queen and members of the Royal Family feature prominently, but then as we have seen in other TV related streams, the BBC presenters and other celebrities feature also. The phenomenon of celebrities tweeting about the broadcast and being retweeted in large volumes is a common observation and is seen here with comedian, Frankie Boyle and Radio 1’s Matt Edmondson featuring. 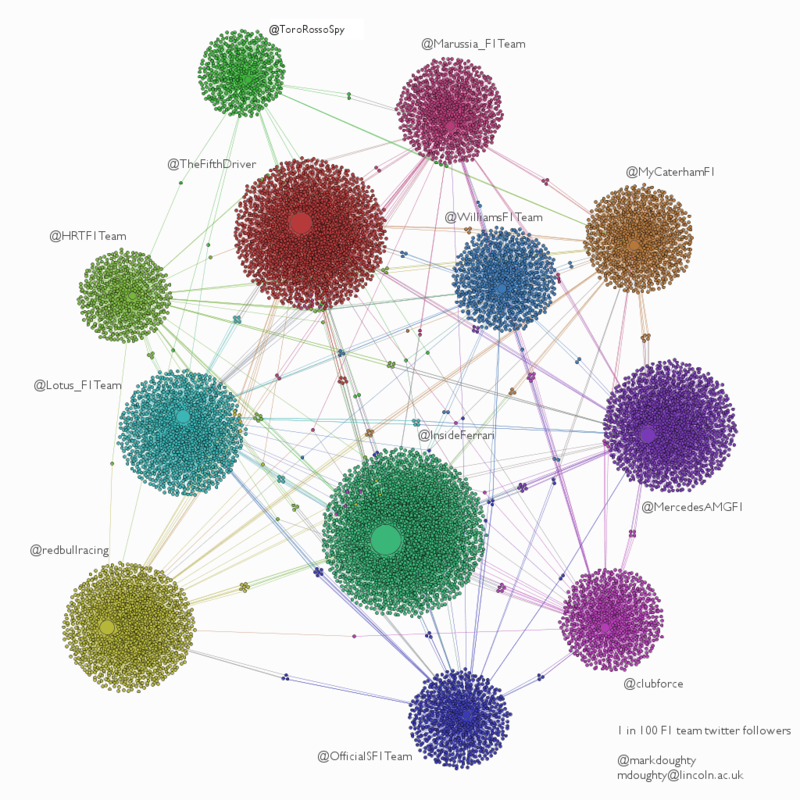 The network of viewers discussing the proceedings shows a typical profile for TV audience Twitter networks. 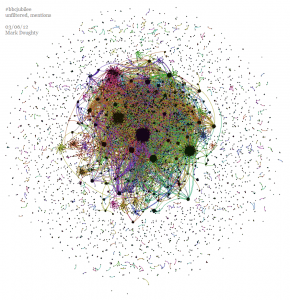 Large numbers of users linked to one or two others through ‘mentions’, while a small number of celebrities and popular tweeters are mentioned by large numbers of other users as their tweets are retweeted through the network, seen here by the large clusters in the centre of the network. 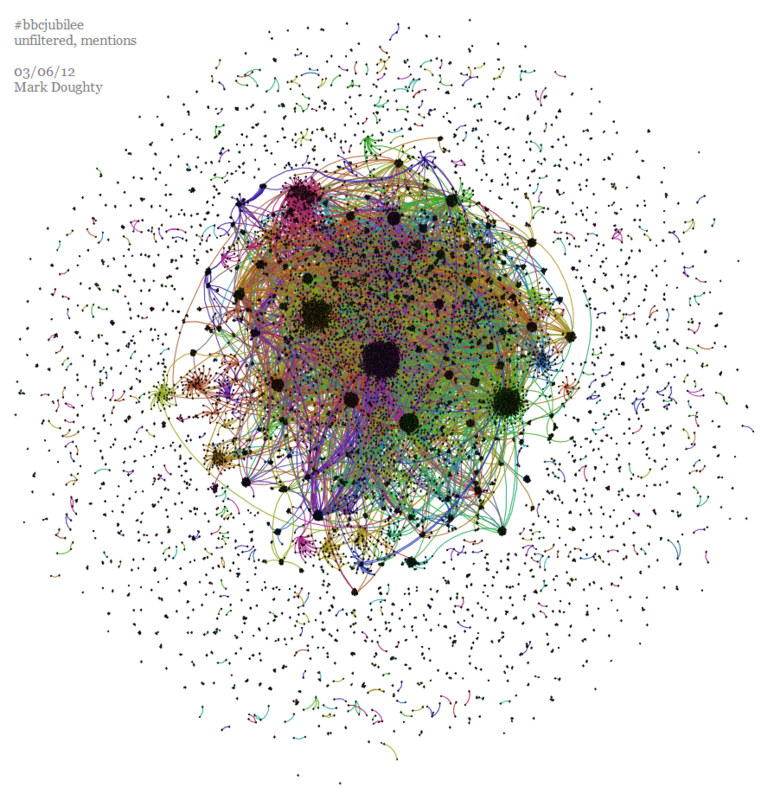 This gives us more good data to try to understand the social nature of these networks of, in most cases, non co-located TV viewers, and what it can tell us about TV audiences in general. I’m looking forward to discussing this with others at the upcoming EuroITV 2012 conference in Berlin! Academic year ends – next years challenges? We have had a busy year in the School of Computer Science this year. As well as securing BCS (British Computer Society) accreditation for our undergraduate and postgraduate taught courses, we have hosted a Microsoft Windows phone 7 ‘phone camp’, a 24 hour ‘Game Jam‘, and held numerous open days and applicant taster events. The challenges for next year will not only be to maintain these achievements and to further improve the student experience in the School of Computer Science, but also to adapt to the new fee structure within which our new students will be studying. Contrary to the popular media-supported belief, these students will not have to pay the course fees up front, but will start to pay them once they have graduated and are earning above a threshold of £21,000. Will this new intake of students coming to University under this new fee regime have different expectations and demands to our previous intakes? That is difficult to say. What is clear however, is that the course standards and requirements will not change – there may eventually be more transparency in how courses are administered and managed however. This is already the case with External Examiner reports for example, as they are considered public documents, as are QAA institutional review reports and other documents. The evidence is already showing that the application pattern has changed slightly this year, with students deciding on their final University choice later in the application cycle. Research challenges are growing both in the School and across the University sector as the 2014 REF deadlines get ever closer. Research outputs and publications are high on everyones list of priorities. I will be in Berlin in July at EuroITV 2012 to present my latest paper “Who is on your Sofa? TV Audience Communities and Second Screening Social Networks“. I presented a short paper at this conference last year in Lisbon and found the conference to be a fascinating mix of computer science, HCI, TV broadcasting and technology. I expect this years conference to be just as good as last year! Was it ‘bingo time’ for the Raspberry Pi? [flickr]5841341403[/flickr] “It’s bingo time for Arsenal!” exclaimed Gary Neville during his punditry for the Arsenal-Milan Champions League clash last night. It certainly was – except they just couldn’t get the last number on their card filled. I know just the feeling – the uncomfortable, yet tantalising sensation of being so near to a goal, yet so far. And so it was with the ‘release’ (a term used in the loosest sense) of the Raspberry Pi. All of the hype, the preamble, the hyperbole of how this diminutive device will be the saviour of computer science, how it will reignite our passions for programming and quite possibly halt the destruction of western civilisation as we know it all came to a head on February 29th at the much anticipated hour of 6am GMT. The release announcement revealed that two electronics companies, RS and Farnell would handle the distribution of the initial run of 10,000 units, and that they would also be handling the manufacture of the devices from then on. With the full weight of expectation of the computer science community pressing down on them, the online storefronts dutifully cracked under the strain. When most customers were able to gain access, it was too late, and only ‘expressions of interest’ for the devices were being taken. As has been blogged elsewhere, the failure of online commercial storefronts to handle heavy customer demand is a concern for retailers of products with massive expectations from a more-than-willing, paying public. The levels of expectation for this product were known well ahead of release. A more managed approach, giving customers a clear level of expectation would have been received much better than overloaded servers. I will stick to my emulated ARM cpu within QEMU full system emulation running on Ubuntu for the foreseeable future (see here or here for excellent info on setting a system like this up). The saving of western civilization will just have to wait a while.